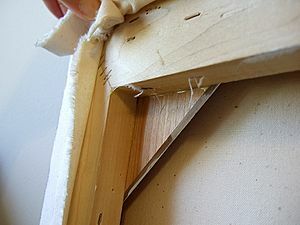 Canvas is a thick material usually made of woven cotton. It is used for tents and sails on boats and other places where a sturdy material would be good. It is similar to the material in blue jeans. It is often a white or pale tan color. It can also be used for painting or even making shoes. Modern canvas is usually made of cotton or linen, although historically it was made from hemp. It differs from other heavy cotton fabrics, such as denim, in being plain weave rather than twill weave. Canvas comes in two basic types: plain and duck. The threads in duck canvas are more tightly woven. The term duck comes from the Dutch word for cloth, doek. In the United States, canvas is classified in two ways: by weight (ounces per square yard) and by a graded number system. The numbers run in reverse of the weight so a number 10 canvas is lighter than number 4. 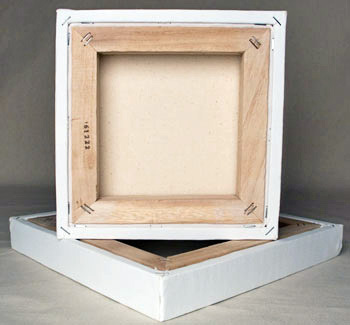 Canvas has become the most common support medium for oil painting, replacing wooden panels. It was used from the 14th century in Italy, but only rarely. One of the earliest surviving oils on canvas is a French Madonna with angels from around 1410 in the Gemäldegalerie, Berlin. Its use in Saint George and the Dragon by Paolo Uccello in about 1470, and Sandro Botticelli's Birth of Venus in the 1480s was still unusual for the period. Large paintings for country houses were apparently more likely to be on canvas, and are perhaps less likely to have survived. It was a good deal cheaper than a panel painting, and may sometime indicate a painting regarded as less important. Sailor Bag made of Canvas. Canvas Facts for Kids. Kiddle Encyclopedia.